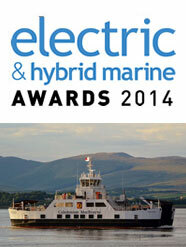 Caledonian Maritime Assets Ltd (CMAL) has won Electric and Hybrid Propulsion System of the Year for MV HALLAIG at the inaugural Electric & Hybrid Marine Awards in Amsterdam, The Netherlands last night (Thursday 26 June 2014). The ceremony hosted at the 2014 Electric and Hybrid Marine World Expo, the international exhibition of electric and hybrid marine propulsion systems, technologies and components, honoured the world’s finest engineers, innovations and products in the electric and hybrid marine arena. CMAL was awarded Electric and Hybrid Propulsion System of the Year for MV HALLAIG, the world’s first seagoing passenger and vehicle roll-on, roll-off hybrid ferry to incorporate a low-carbon hybrid system of diesel electric and lithium ion battery power. The technology is cleaner, quieter and cheaper to operate and maintain than ever before. The vessel is powered by small diesel generator sets, feeding power to a 400 volt switchboard, which supplies power to electric propulsion motors that turn the propellers. The judging panel include 24 of the world’s leading marine journalists, industry experts and academics. CMAL owns the ferries, ports and harbours and infrastructure necessary for vital ferry services serving the West coast of Scotland and the Clyde Estuary. CMAL are wholly owned by Scottish Ministers. Scottish Government is providing CMAL with a loan of £20 million for the procurement of hybrid vessels. The Low Emission Hybrid Ferries Project received additional funding of £450,000 from the European Regional Development Fund (ERDF).